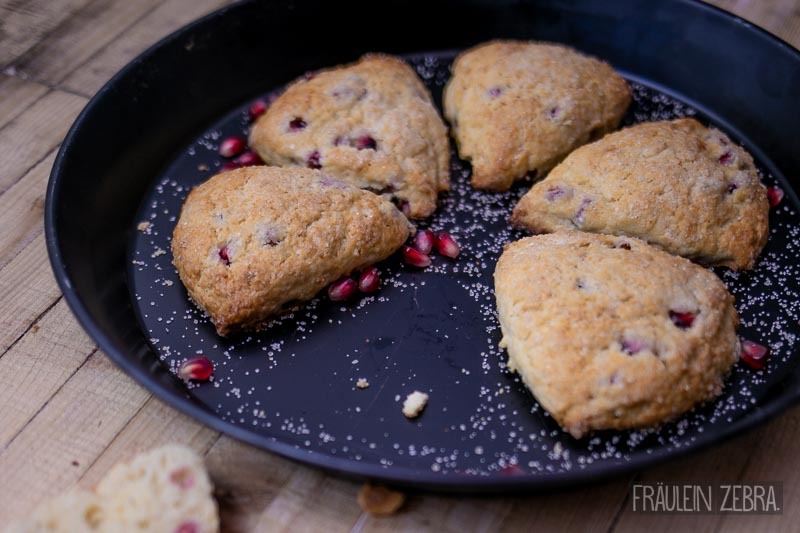 Pomegranate Scones with Vanilla | #ad – Fräulein Zebra. the time has come! 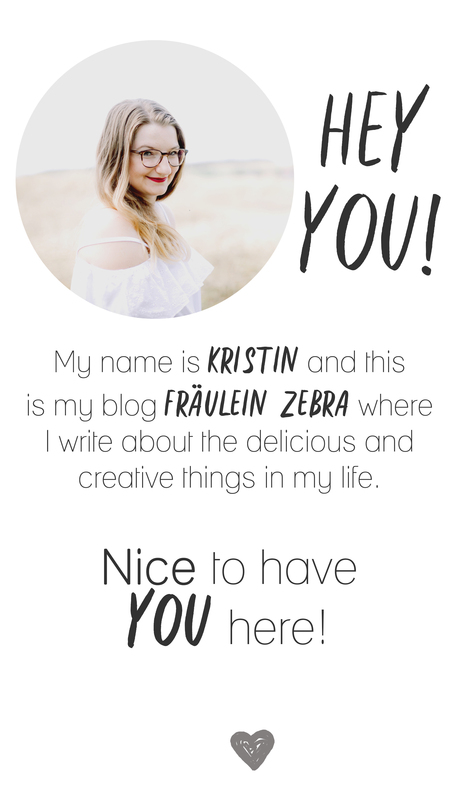 So long in the planning and finally I can share with you, the best readers of the world, what I have been working on in the last few weeks: Fräulein Zebra’s Advent Calendar 2018! In addition, I have worked really hard and organised quite a few for you. The focus this year is on regional companies, because Franconia has so much to offer! All too often, those regional gems get lost in the bulk of our consumption and we miss out on the best things. That’s what I’m trying to change and together with my wonderful sponsors have put together some great prizes for you! So now I want to briefly introduce you to my wonderful Christmas elves & sponsors, then we’ll continue straight to the recipe – I promise! ATTENTION – IF YOU DON’T WANT ANY HINTS ON WHAT’S IN THE CALENDAR, YOU SHOULD SKIP THIS BIT! Nice on the outside, yummy on the inside – the perfect combination for a unique present for foodies. The two founders Jannik & Tilman put delicious Nuremberg gingerbread into a limited (and really pretty!) cardboard box, designed by London based artist Alec Doherty! Fruity, tangy and something very special – for more than ten years, Johannes has been working on his sparkling apple wine and you can really taste this love and attention to detail in his products! Innovative and extraordinary books for ‘makers’ – they offer something for all creative people, whether you’re interested in cooking, sewing, gardening, painting or knitting! In search of the perfect bracelet Grete and Heidi became accomplices and now produce lovingly handcrafted & very beautiful brass jewelery with personalised lettering! The first weekend of advent is just around the corner and I think we should all take this as an opportunity to slow down a bit. Just deliberately take some time, even if you’re pretty busy, and spend it with the people you care about. And what better way to spend some quality time with your loved ones than with a wonderful breakfast? 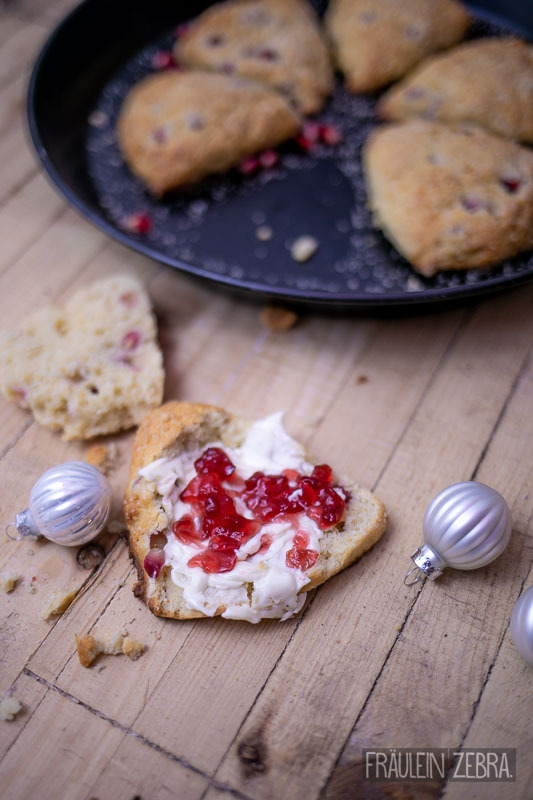 The plan: Sneak into the kitchen in the morning and by the time you’re ready for your sedcond coffee the scent of freshly made scones will spread through the kitchen … mmmmh, I can already smell it, how about you? 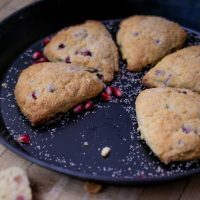 These Pomegranate Scones with Vanilla are not difficult to make and make for such a lovely breakfast with butter and jam or try it as an afternoon treat, properly authentic with clotted cream – you should make it right away! 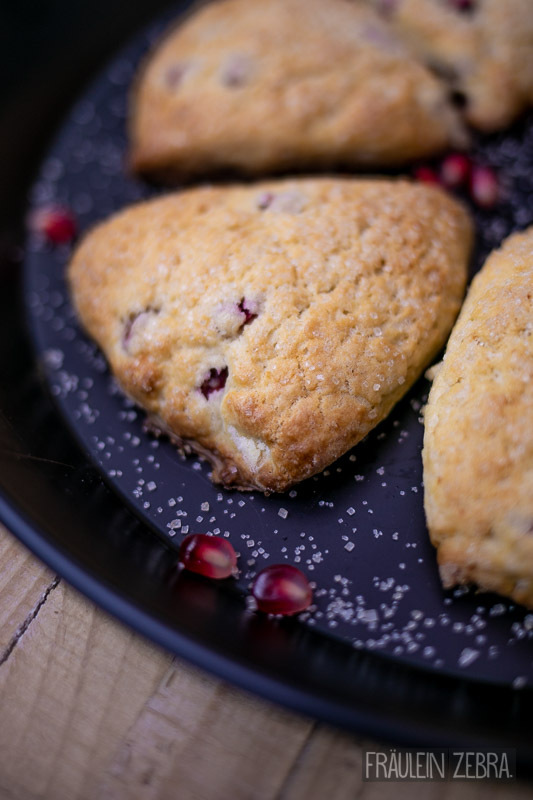 The scent of freshly baked scones and sweet vanilla is in the air - what a perfect way to start the day! In a large bowl, mix the flour, almonds, sugar, baking powder and salt. Add the cold butter and rub it briefly with your fingers into the dry ingredients - there should still be a few small bits of butter visible. 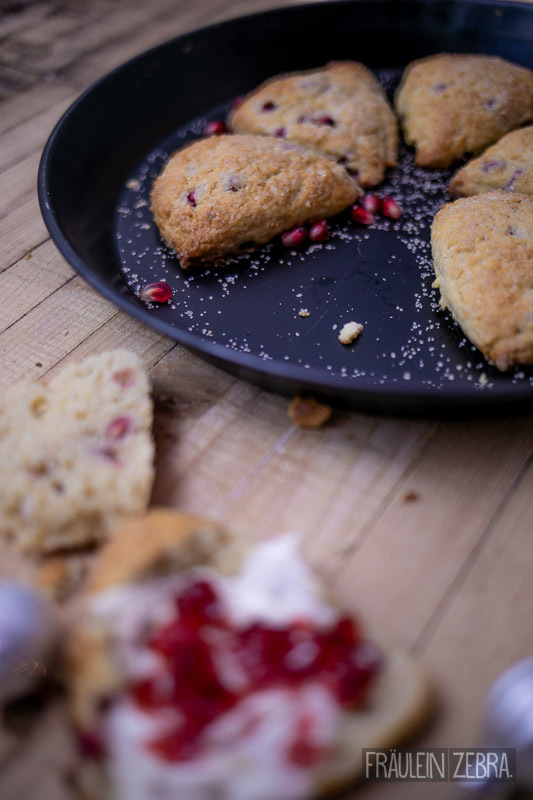 Then stir in the pomegranate seeds. Now add the egg, cream and vanilla extract and mix with your hands until just combined. Turn onto a floured work surface and form the dough into a 3-4 cm thick circle (about 15-20 cm in diameter). Use a sharp knife to cut it into sixths. Put dough triangles in the fridge for half an hour. In the meantime preheat the oven to 200° C (180° C fan forced). 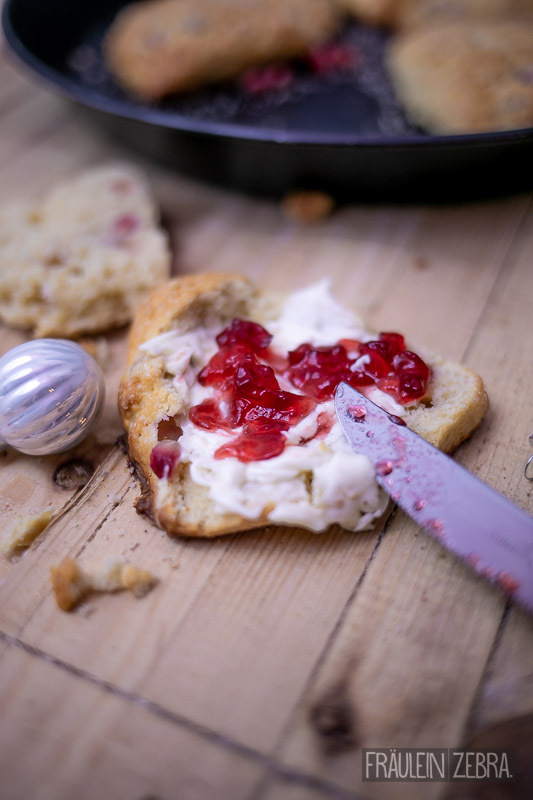 Place the scones on the baking tray leaving some space in between and brush them with milk. Sprinkle generously with brown sugar and bake in a hot oven for 25-30 minutes. Allow to cool slightly and serve while still a bit warm! 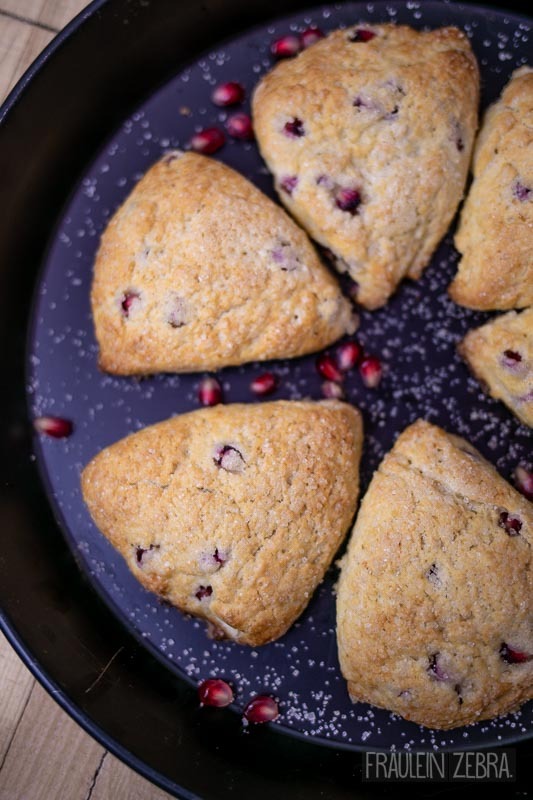 So sweet and fruity – I can’t get enough of it. Have you ever baked scones yourself? And what are your plans for this first weekend of Advent?